Sublime Chicken Marsala. Surprisingly Easy! 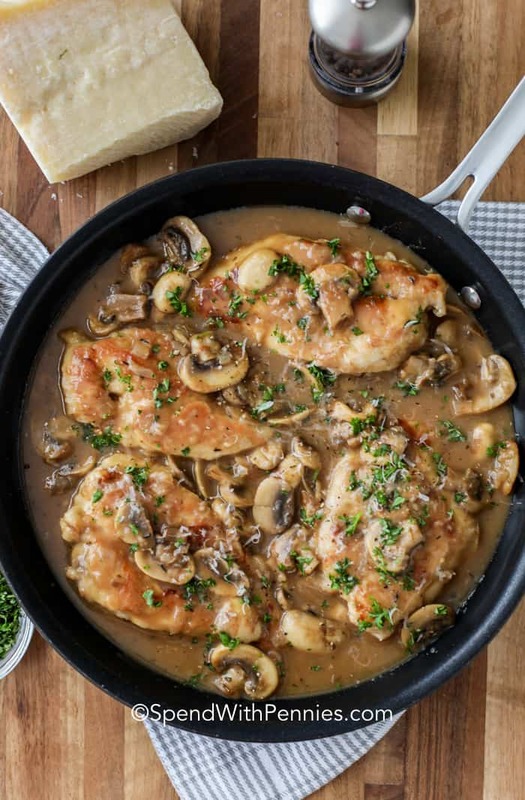 This easy Chicken Marsala recipe is even better than what you would get in a fancy Italian restaurant, and a lot less expensive too! If you ever need an entrée to impress dinner guests or make a family celebration special, you can’t go wrong by serving Chicken Marsala. We love this creamy chicken marsala served over pasta with a side of fresh bread and garlic butter and a big fresh Italian Salad. What is Chicken Marsala? It is an Italian-inspired dish very popular in restaurants often found on the menu next to Chicken Parmesan. Chicken Marsala is made with chicken breast fillets lightly browned and submerged in a rich Chicken Marsala mushroom sauce. The extraordinary tastiness of the dish is owing to the Marsala wine, which is the foundation ingredient of the sauce. Marsala, in case you are wondering, is a Sicilian fortified wine, similar to sherry or port. It comes in both sweet and dry versions (you want to buy dry Marsala for this recipe). 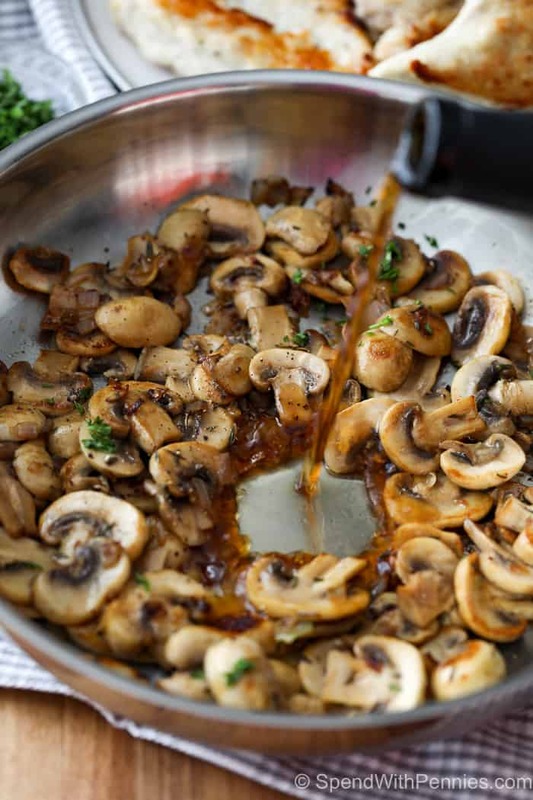 Other Chicken Marsala ingredients include mushrooms, shallots (or onion), thyme and butter. Start with boneless, skinless breasts and your sharpest thin bladed knife. Using a paper towel, firmly grab and hold the thinnest end of the breast. Slice toward the thickest end, horizontally, so you wind up with two even halves. That’s all there is to it! 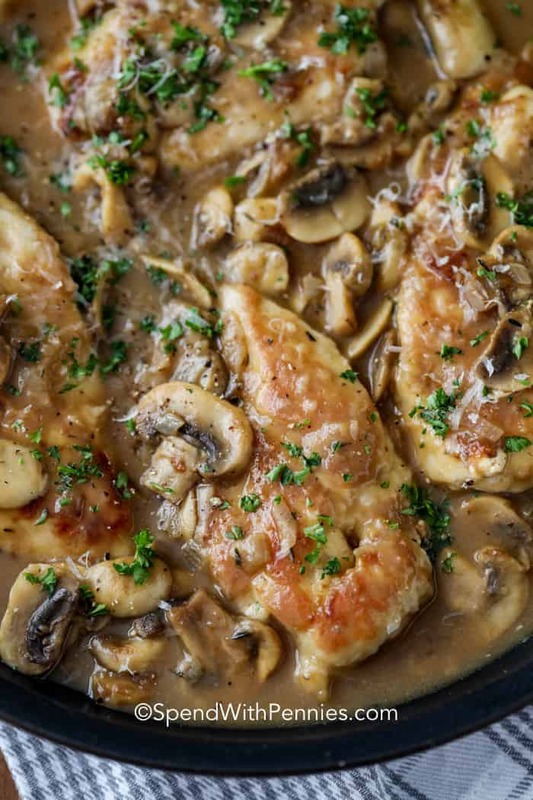 Now you’re ready to make the best Chicken Marsala recipe ever. Pound the fillets to ¼ inch thickness and dredge in flour. Cook on the stove top in a bit of olive oil for a few minutes. Set chicken aside. In the same pan, add the shallots and thyme until tender, then add the sliced mushrooms and cook until juices release. Add the Marsala wine and remaining sauce ingredients and reduce. Serve with the chicken. If that doesn’t sound rich and delicious enough already, you can up the ante by making creamy Chicken Marsala (although not traditional, it is delicious). Substitute 1/3 cup of heavy cream for the same amount of chicken broth for a truly sublime experience. Fold in half or roll and fasten tightly with toothpicks. Then proceed with the recipe described here. 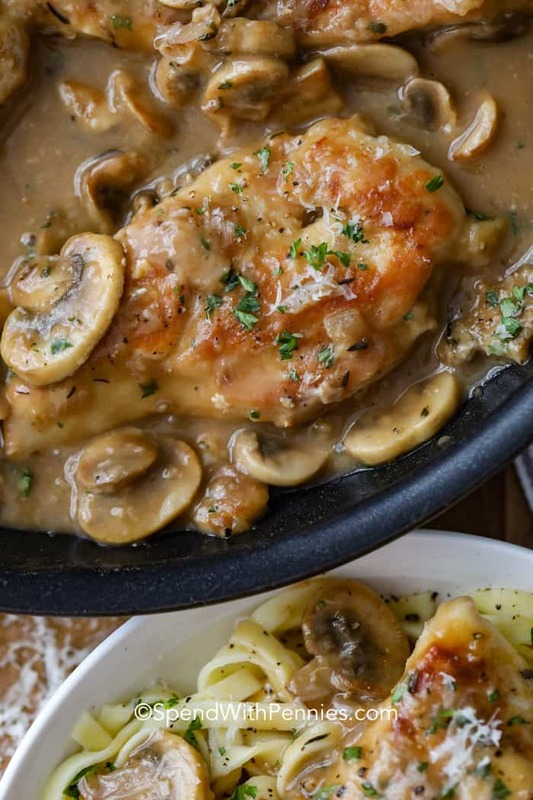 At the other end of the spectrum, you can make a crock pot Chicken Marsala. You don’t even have to fillet the breasts for this version. Just place all the ingredients in a crock pot and cook on high for four hours or on low for six. Then make a cornstarch and water slurry to thicken the sauce, and serve over pasta, for a super yummy and easy dinner. Chicken Parmesan Casserole – love casseroles! Creamy Chicken Enchiladas – so delcious! Chicken Marsala sauce is very rich and flavorful, and a starch completes the meal perfectly. You can serve it over angel hair pasta to fill the plate. You might try buttered noodles or orzo pasta on the side if you’d prefer. To complete the presentation, plate it up with some roasted broccoli or roasted Brussels sprouts. And don’t forget a crusty, rustic bread, or 30 Minute Dinner Rolls to sop up the sauce. Your dinner guests and family will be in heaven! 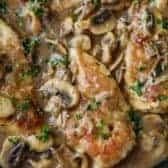 Easy Chicken Marsala is even better than what you would get in a fancy Italian restaurant, and a lot less expensive too! Ready in about 30 minutes. Pound chicken to 1/4″ thick (you can cut them in half if they’re very large). Season with salt and pepper and dredge in flour. Preheat olive oil in a large pan over medium high heat. Cook chicken in batches, 3-4 minutes per side or until cooked through. Remove chicken and place on a plate. In the same pan, add 2 tablespoons butter, thyme and shallot. Cook until tender, about 3 minutes. Add mushrooms and cook until juices are released, about 5 minutes. Stir in flour 1 1/2 tablespoons flour and cook 1 minute more. Add Marsala wine and broth and simmer about 3 minutes, until thickened and bubbly. Place chicken back into the pan and simmer 2-3 minutes or until hot. Garnish and serve over pasta. 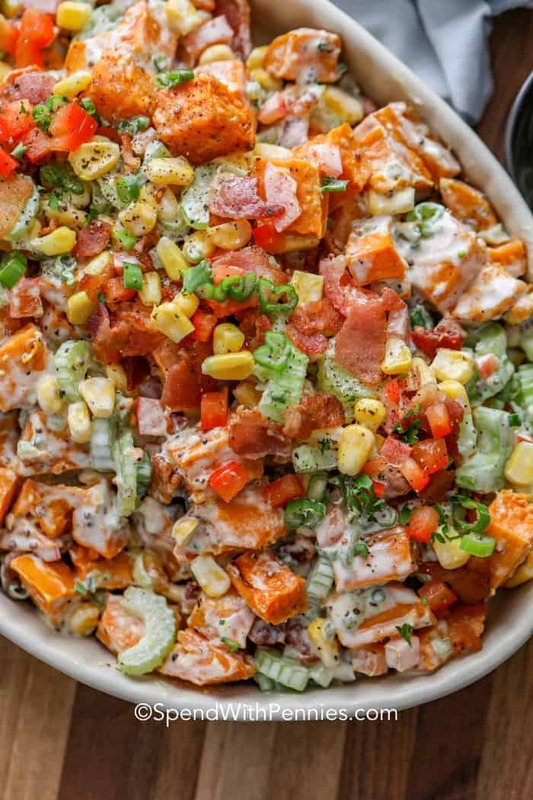 A new twist on a potluck favorite! Pork Teriyaki is one of the most delicious ways to prepare pork tenderloin. Packed with mouthwatering umami flavor, teriyaki pork can be grilled, baked in the oven, or prepared it in your slow cooker. Scrumptious and low in fat, a perfectly cooked pork tenderloin is a fork-tender cut of meat, and is super juicy when treated right. 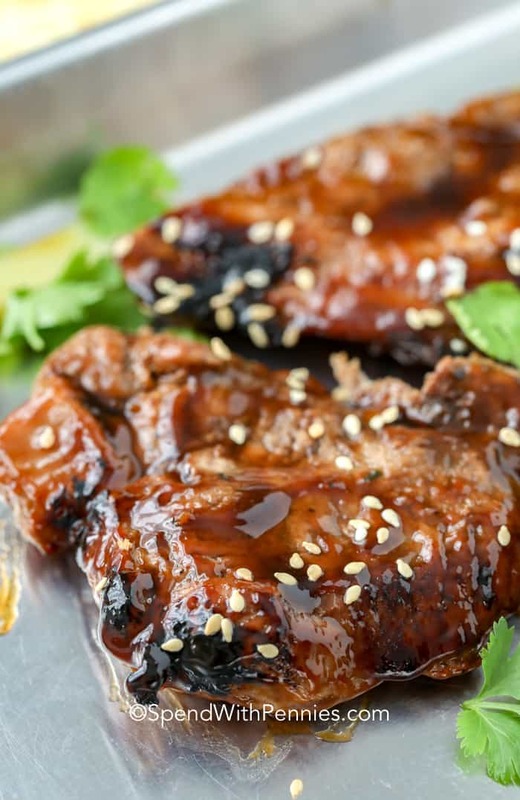 It really benefits from quick cooking at a high temperature and marinating in a rich liquid or sauce, such as teriyaki marinade for pork. When you’re making pork teriyaki, don’t make the mistake of buying pork loin in place of tenderloin. Although it sounds very similar, pork loin comes from a different part of the animal, and is a fattier, tougher cut that benefits more from low, slow roasting. 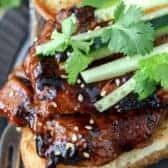 Pork tenderloin is a boneless, lean cylinder piece of meat and it’s perfect for slicing into medallions, as called for in this teriyaki pork tenderloin recipe. Be aware that pork tenderloin often has a tough section of silvery-white connective tissue on parts of the surface, known as “silverskin.” The silverskin does not soften with cooking, and needs to be trimmed off before slicing. It’s white/silver in color. Slip a knife under this piece of tissue and remove it before marinating or cooking. 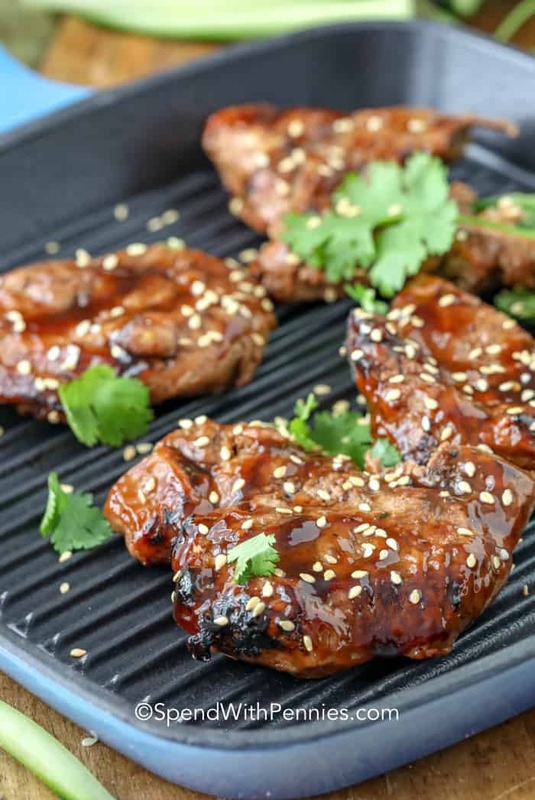 Teriyaki Sauce is made with soy sauce as the foundation and has brown sugar for sweetness and garlic and ginger for flavor. It’s the sugar that makes teriyaki such a great marinade for meat. When proteins in meat combine with sugars or carbs during cooking, the result is a delectable caramelized glaze. If you buy bottled teriyaki, be sure to get the thick teriyaki sauce (you want the consistency of bbq sauce, not the one that is runny like soy sauce). Teriyaki Chicken – A tender and delicious stir fry. Pineapple Teriyaki Shrimp Foil Packets – An easy meal! Slice the pork loin into chunks and pound to 1/2″ thick. Place on a medium-hot grill, 3-4 minutes per side (it’s quick)!! Remember that pork tenderloin should be cooked to 145°F and can be a little bit pink in the middle. It only needs a few minutes each side. 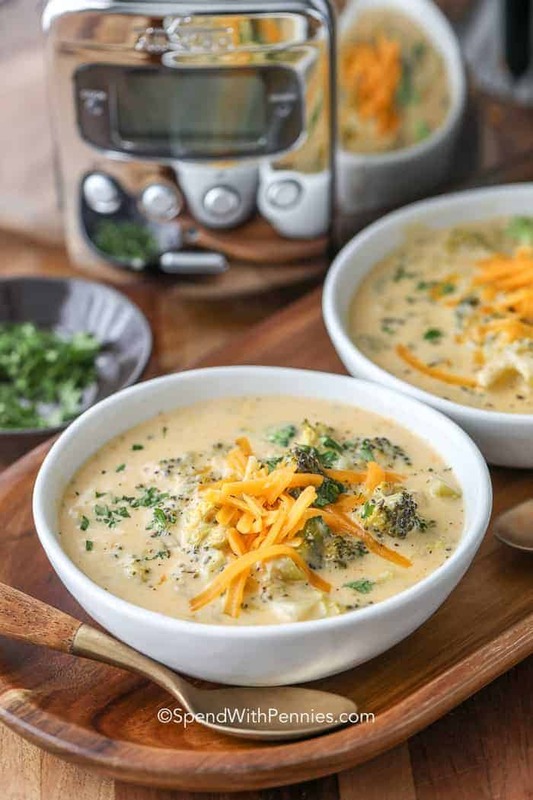 Serve on a bun or over rice with steamed broccoli and enjoy! We always toast the rolls with a bit of Homemade Garlic Butter for great flavor. 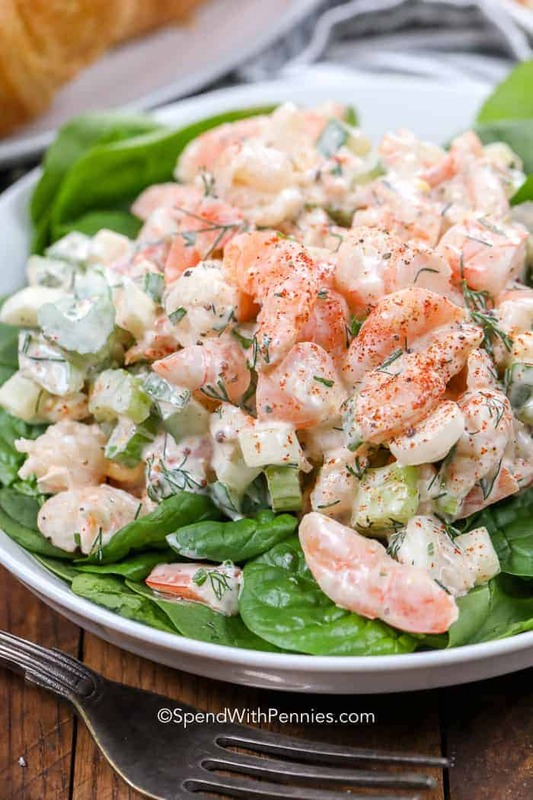 Add in some cucumbers and cilantro for freshness and enjoy! If you’re not up to grilling, then teriyaki pork can be broiled in the oven. Place on a foil lined pan (teriyaki sauce is sticky and difficult to clean) and broil 4″ from the heat for about 5 minutes per side or just until pork reaches 145°F. Teriyaki pork goes great with coleslaw, spicy-hot kimchee, and sweet potato fries. 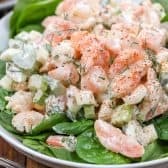 We usually serve this with a fresh salad Easy Kale Salad with Fresh Lemon Dressing, Fresh Corn Salad or easy Potato Salad. 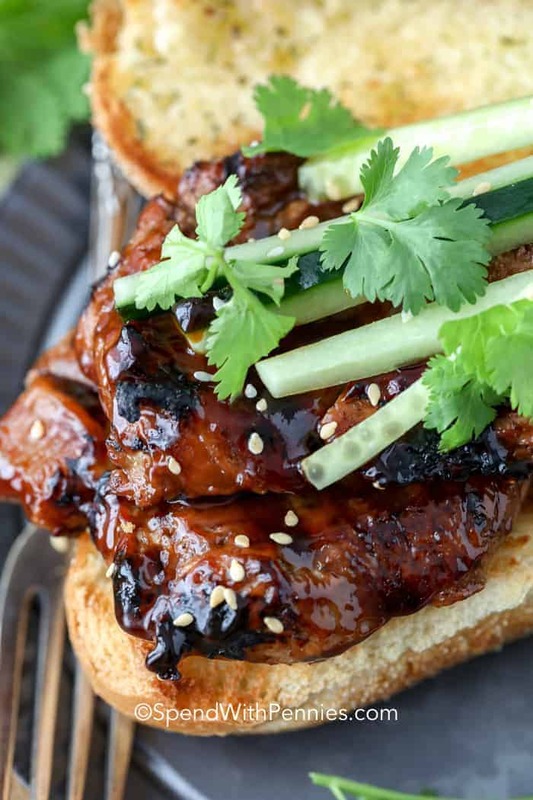 Pork Teriyaki is one of the most delicious ways to prepare pork tenderloin. Packed with mouthwatering umami flavor, teriyaki pork is always a favorite. Cut each pork tenderloin into 4-5 pieces, pound pork pieces until 1/2″ thick. Sprinkle pork with sesame seeds and green onions if desired. We love to serve the pork medallions on toasted rolls with chopped green onions. Serve and Enjoy! 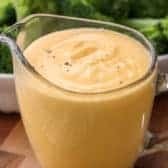 This super easy Cheese Sauce recipe is a game changer in the kitchen and is way better than any store-bought kind! 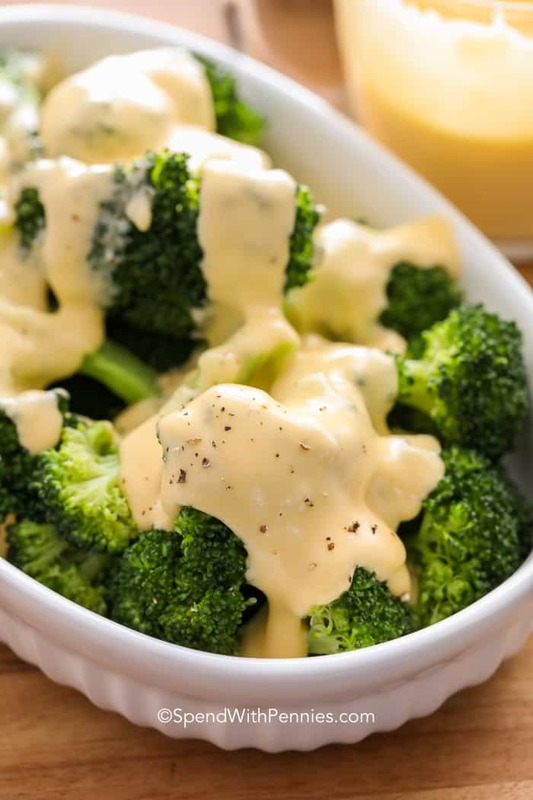 It’s so versatile, it can be used as a nacho cheese sauce on loaded nachos, mac and cheese sauce or even a cheese sauce for broccoli! 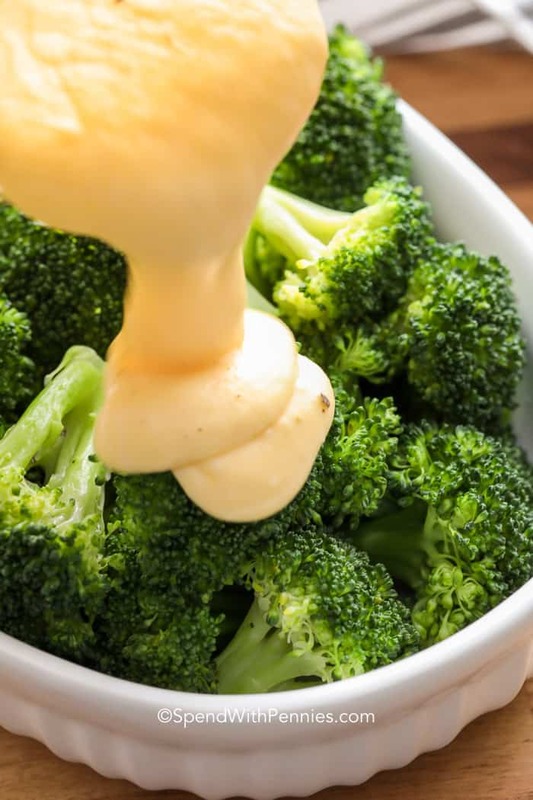 The kids will love this homemade cheese sauce because it goes with everything! And how much easier can it get with only a handful of ingredients? Honestly the best cheddar cheese sauce you’ve ever had. The most important part of any good sauce is a ‘roux’ which is, essentially, a cooked, thickened combination of butter and flour. This will be the base of the sauce and it only takes a few minutes to whip up! Be sure to stir it constantly and cook the flour to rid of any starchy flavor before adding the other ingredients. You can use any type of cheese for this recipe based on what you’re pouring it over. Slowly add in some milk to the roux and whisk constantly (it will be super thick). Keep adding a little at a time until it smooths out. Whisk until it reaches a boil and let bubble 1 minute. Remove from heat and add cheese. Whisk until smooth. Remember to always remove from the heat before adding cheese, the milk will still be plenty hot enough to melt it. Cheese can separate or become grainy if it gets too hot. Be sure to adjust for taste, feel free to add a splash of hot sauce or garlic powder…anything that you want! The ratio below will create a perfectly thick and cheesy sauce and shouldn’t require thickening. The best way to thicken a cheese sauce would be to add more cheese! Who can resist a thick, creamy, savory cheese sauce perfect for making Homemade Mac and Cheese too! Another way to thicken a cheese sauce is to add a little bit of cornstarch slurry (equal parts cornstarch and water) added a little at a time to hot cheese sauce. This method is less desirable, you do risk the cheese separating if you re-heat it too much when thickening. 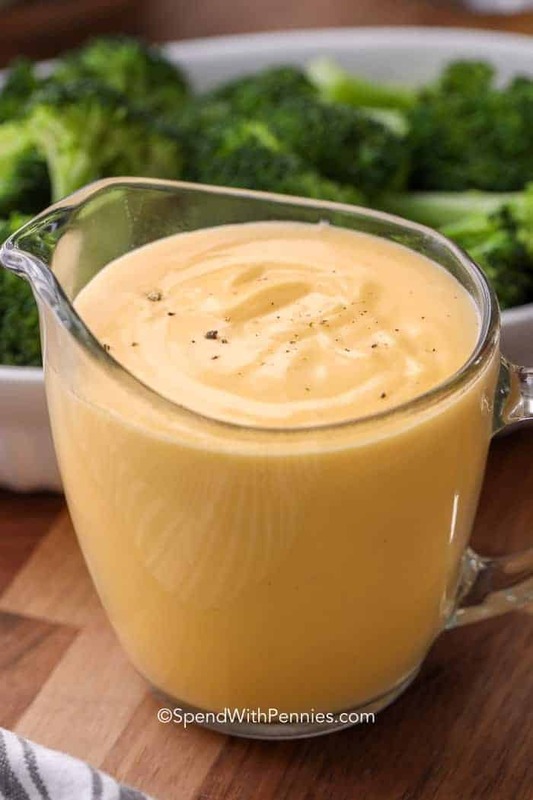 This super easy cheese sauce recipe is a game changer in the kitchen and is way better than any store-bought kind! Melt butter in a saucepan. Add flour and cook for 1-2 minutes. Add milk a small amount at a time, whisking smooth after each addition. Add onion powder and white pepper. Continue to cook over medium heat, whisking continually until slightly thick. Remove from heat, and add cheeses. Stir until melted. Nutrition information is based on 1 cup of sauce. 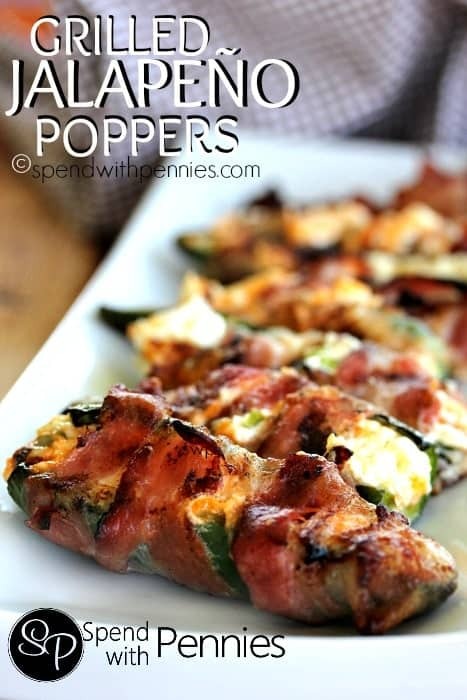 Grilled Bacon Wrapped Jalapeno Poppers are the perfect summer-time snack or game day appetizer! Fresh jalapenos are stuffed with a mixture of cheeses and seasoning and wrapped in smoky bacon and cooked on the barbecue until tender. The cheese becomes perfectly melty, the peppers tender and the bacon crisp and smoky for the most amazing bite. I absolutely adore stuffed jalapeno poppers in any way, shape, or form including Jalapeno Popper Dip to Jalapeño Cheddar Stuffed Burgers. And of course what doesn’t taste amazing wrapped in bacon? 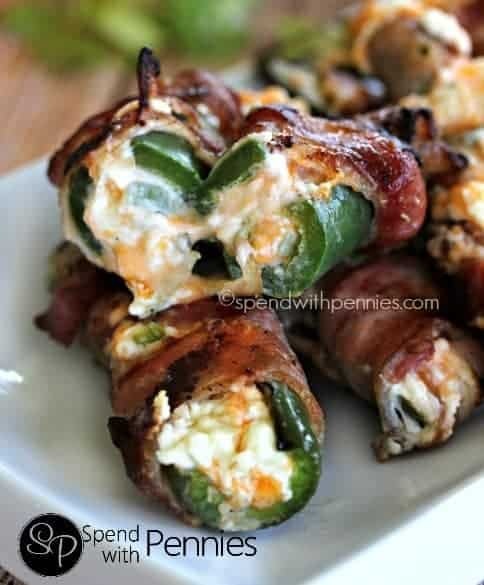 I could pretty much eat these bacon wrapped jalapeno poppers at any meal and I especially love this version using fresh jalapenos and bacon. It just so happens that skipping the breading makes these into a low carb/keto jalapeno popper! When cutting several jalapenos, please please please wear gloves. The oils in the peppers can really affect (and burn) your skin if you’re cutting several peppers. Control the spice level: To reduce the heat from jalapenos (and other spicy peppers), be sure to remove all of the seeds and membranes as that’s where the capsaicin is contained (which is what makes them spicy). 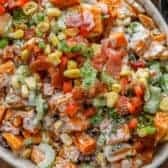 You can use any peppers in this recipe including sweet baby red & yellow peppers if you don’t like spice or would like to have another option for those that don’t eat spicy foods. Bacon: I slightly pre-cook the bacon. 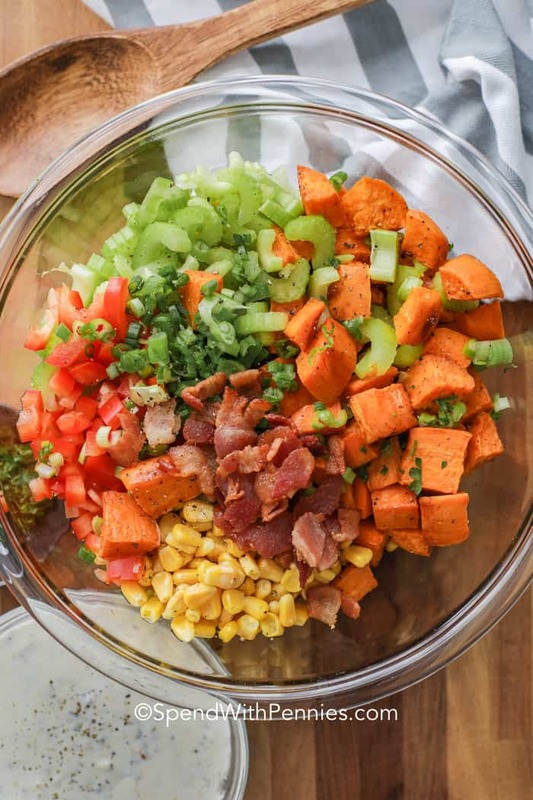 This extra step is great for grilling because it helps reduce flare ups (more on reducing flare ups below) and it always results in a crisper bacon without overcooking the peppers. Grilled Jalapeno Poppers: We most often cook these on the grill in the summer, and while you can cook them directly on the grill, a grill mat helps reduce flare ups! I use grill mats for so many things from burgers and veggies to Bacon Wrapped Pork Tenderloin. They reduce flare ups, keep things from slipping through the grates and clean up like a dream. 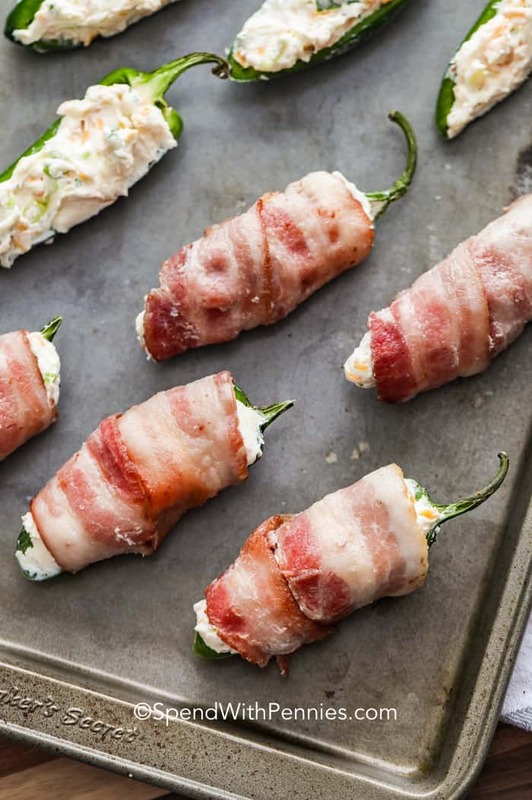 To grill cream cheese jalapeno poppers from frozen, we turn the grill down and cook them low and slow to ensure the middle heats & melts. 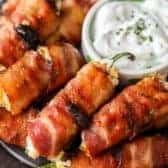 Baked Bacon Wrapped Poppers: In the winter, we bake this stuffed jalapeno poppers recipe in the oven. Preheat to 425 degrees, place on a parchment lined pan and bake about 18-23 minutes or until bacon is crisp and cheese is melted. Broil 1 minute at the end if needed. So easy! Can you Freeze Stuffed Jalapeno Poppers? Absolutely!! 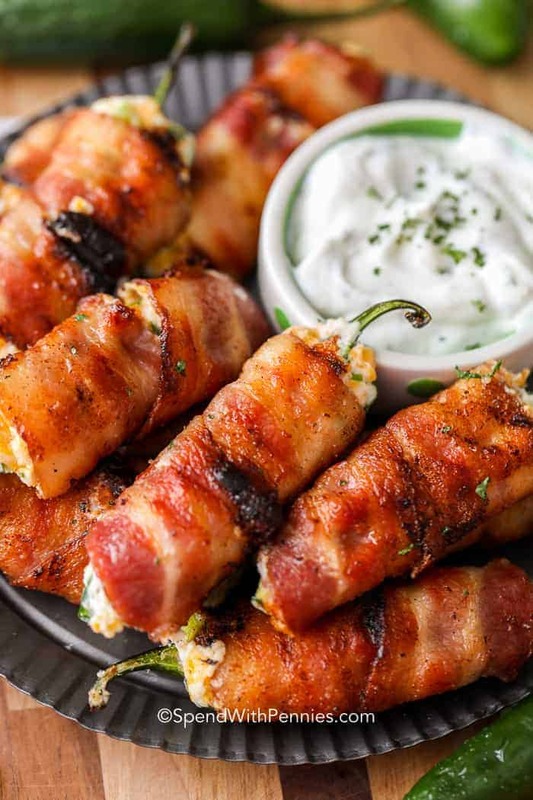 Bacon Wrapped Jalapeno Poppers are the perfect snack to have on hand for unexpected guests. I often make a couple of large trays and freeze them (before cooking). Once frozen I move them to a sealed container (or freezer bag) and store them for a few months. 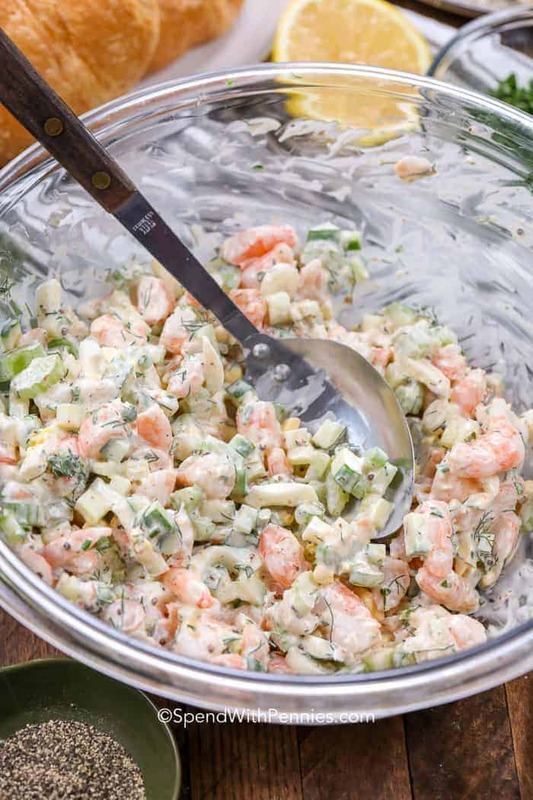 When guests pop by, pour a pitcher of mojitos, heat up the grill and throw these on right from frozen. 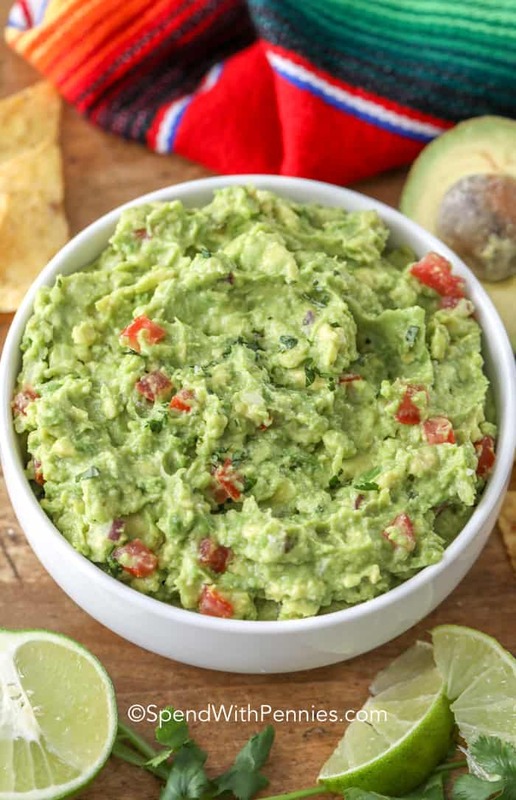 The perfect summer snack! 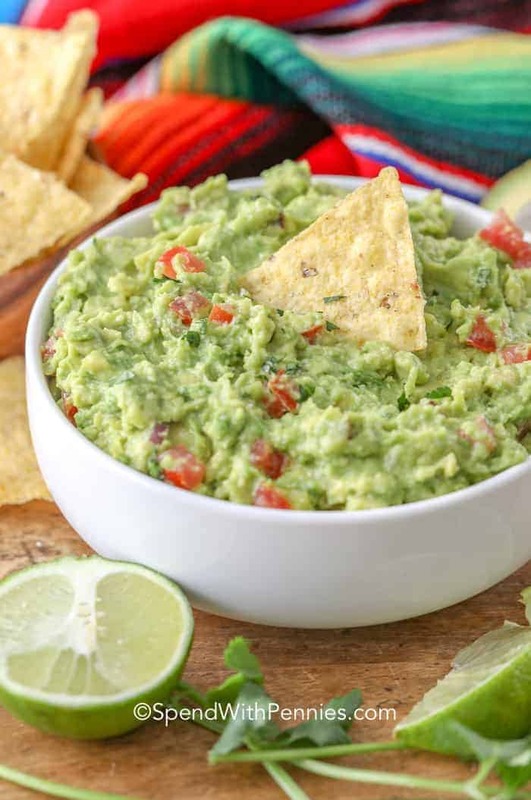 Need More amazing Jalapeno recipes? 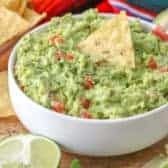 Jalapeno Popper Dip: This has been the a top on my blog for years and years (and is my daughter’s favorite recipe on the whole site). Bacon Jalapeño Cheese Ball Recipe: This cheeseball is the perfect make ahead snack and everyone always loves it! Jalapeño Popper Stuffed Chicken Breasts: Stuffed Jalapeno Poppers make a great snack… but in this recipe you can enjoy them as a complete meal! Jalapeno Popper Crescent Cups: Flaky crescent cups filled with creamy spicy popper dip! Delicious jalapenos stuffed with a gooey cheesy filling and wrapped in bacon! These are grilled until the bacon crisps and the cheese melts .. and are out of this world! Cut the stem off each jalapeno and cut in half lengthwise. Using a small spoon, scrape out seeds & membranes. 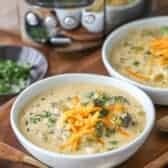 In a small bowl combine cream cheese, green onion, garlic powder and cheddar cheese. Stuff into the jalapeno halves. 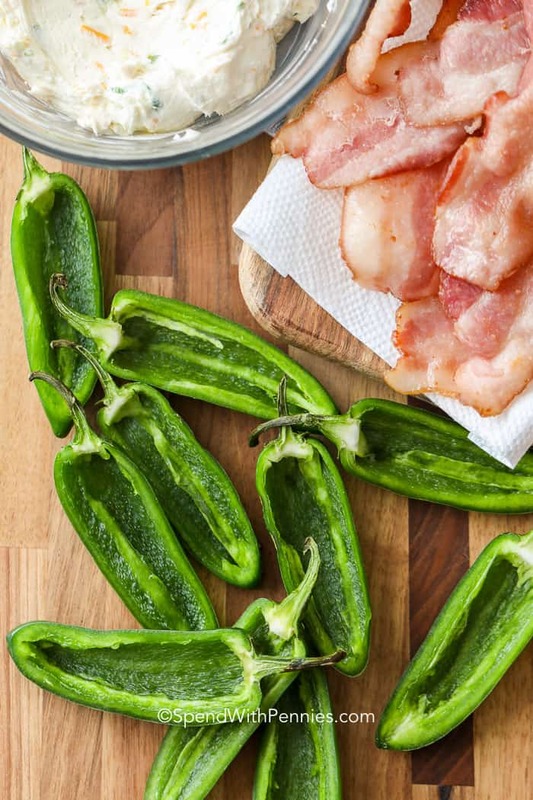 Wrap each jalapeno completely with bacon ensuring the cheese is covered. Secure with toothpicks. Place jalapenos on grill cut side down and grill just until bacon begins to crisp (about 6 minutes). Gently loosen bacon from the grill and flip jalapenos over. Reduce heat to medium-low and cook an additional 10-12 minutes or until bacon is cooked and cheese is melted. Preheat to 425 degrees, place on a parchment lined pan and bake about 18-23 minutes or until bacon is crisp and cheese is melted. CrockPot Beef Stew is one of my all-time favorite slow cooker meals. It’s filling and delicious with tender chunks of beef, carrots, potatoes and peas (or green beans). When it comes to satisfying comfort food, slow cooker Beef Stew is the ultimate! To complete the meal, all you really need to do is add in a side of easy buttermilk biscuits or corn bread muffins slathered with butter. Or, serve it with a substantial homemade bread for dipping in the gravy. Everyone will be in heaven! 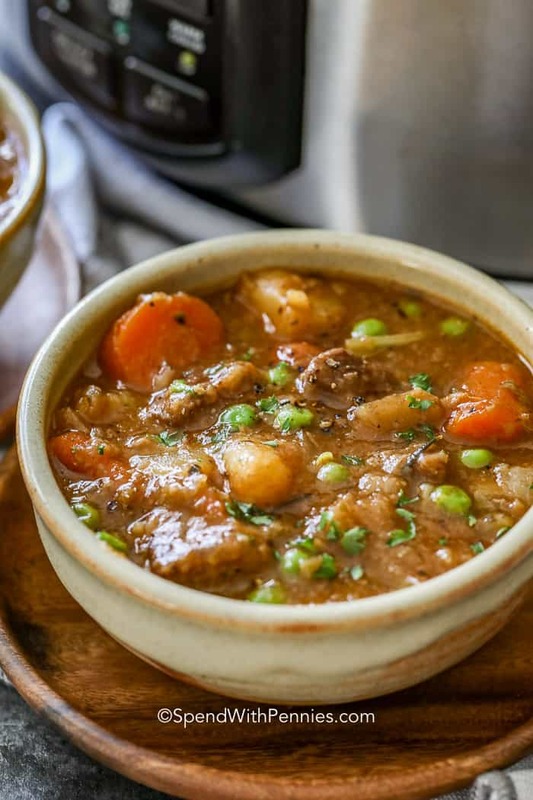 Ingredients for this beef stew CrockPot recipe are beef chuck or stew beef, root vegetables like potatoes, carrots and fresh and peas or beans. The best meat to make beef stew is chuck steak! You’ll have to cut it into cubes yourself. Chuck is a tough, but full-flavored meat that comes from the shoulders and front end of the animal. It is perfect for Crock Pot Beef Stew or pot roast (a similar texture to pork shoulder which is used to make Crock Pot Pulled Pork). It retains its rich, beefy flavor and becomes succulent and fork-tender under the low and slow heat of a crock pot. 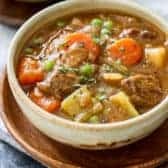 Flavorful Slow Cooker Beef Stew: What really makes a stew a stew is the savory herbs, thickened beef broth and seasonings. To give the dish even more complexity, consider making CrockPot beef stew with red wine. Substitute a cup of a hearty dry wine, such as Cabernet Sauvignon or Merlot for a cup of the beef broth and use it to deglaze the pan you used for browning the meat. You could add in some button mushrooms too. 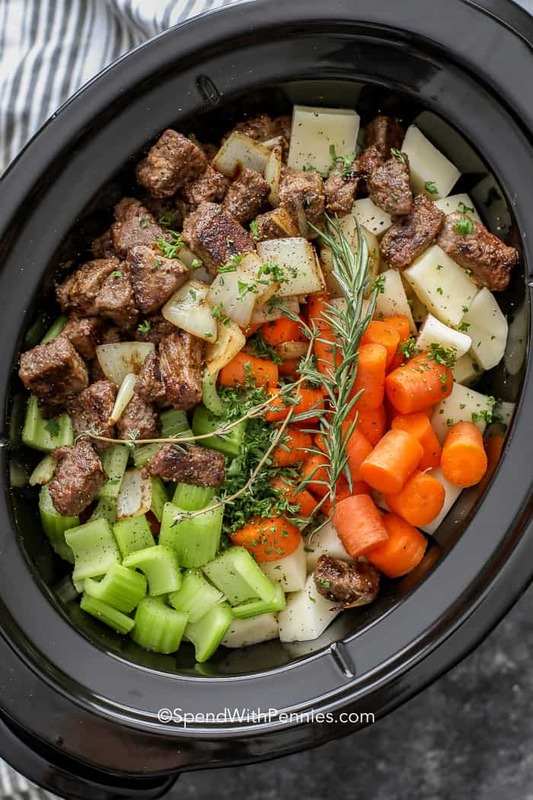 While we love to make a classic stove top beef stew, this easy slow cooker recipe can be left cooking while you go about your day! Crock Pot beef stew comes together in just a few simple steps and the beef gets so tender. Toss the beef in the flour-garlic powder mixture to coat, and brown in olive oil in batches. Don’t crowd the pan. (You can skip this step but the browning adds great flavor to the stew). Sauté the onion in the same pan (use a of broth or red wine to help deglaze and add any brown bits to your crock pot). Add everything to the slow cooker (I use a 6qt crock pot) and cook until the beef is tender. Stir in peas before serving. How Long to Cook Beef Stew in Crock Pot: Crock Pot beef stew is a set-it-and-forget-it kind of meal. Cook it on high for 4-5 hours, or on low for 8-9 until the meat is tender. You can leave it on warm for an additional hour or so if needed. To Thicken Beef Stew in the Crock Pot: I use a cornstarch slurry (equal parts cornstarch and water) and add it in at the end. Allow it to cook about 10 minutes after adding the slurry to get rid of any starchy flavor. We serve beef stew with some crusty bread or homemade dinner rolls for the perfect meal! Leftovers will keep about 3-4 days in the fridge. 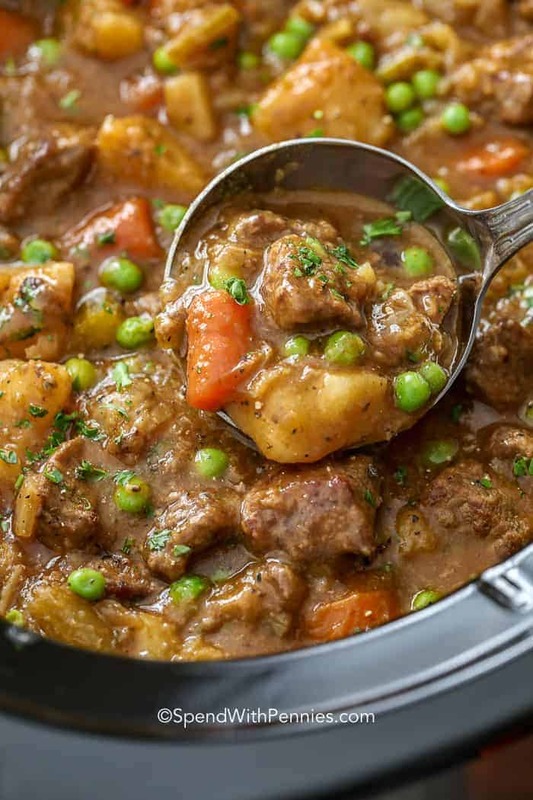 Can you Freeze Beef Stew: You’ll also be happy to know CrockPot Beef Stew freezes really well, so make plenty for those quick-fix meal nights. Leave about an inch of headspace for expansion in plastic containers, and your stew will keep for four months in the freezer. Lamb Stew (Irish Stew) – hearty! CrockPot Beef Stew is one of my all-time favorite one-pot meals. 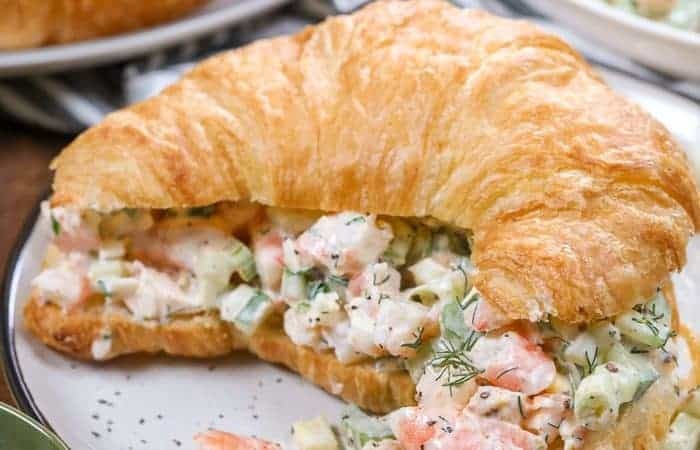 It’s filling, delicious, the family always loves it, and it’s incredibly easy to prepare in advance. Combine flour, garlic powder and salt & pepper to taste. Toss beef in flour mixture. Brown the beef and onions in olive oil small batches. Add some of the broth to the pan and scrape up any brown bits. 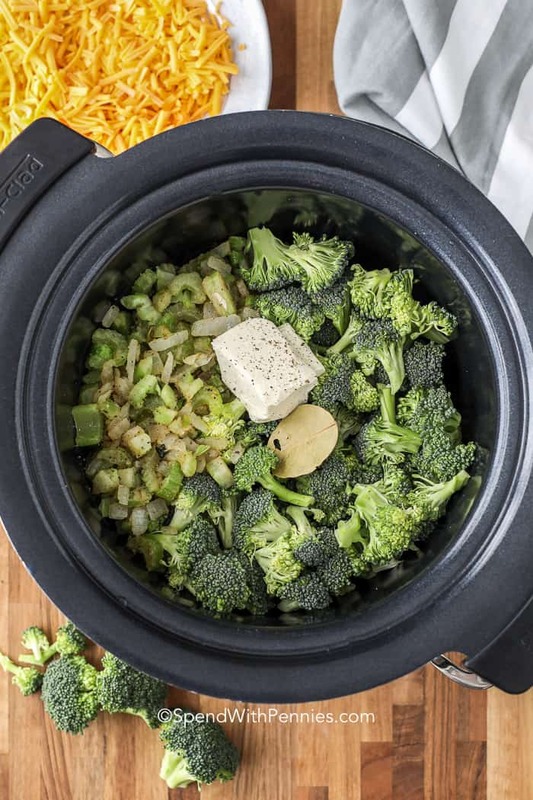 Add all ingredients except peas and cornstarch to a 6QT slow cooker. Cook on high 4-5 hours or on low 8-9 hours or until beef is tender. Mix cornstarch with 2 tablespoons water. Stir into the stew a little bit at a time to thicken (you may not need all of the mixture). Add peas. Cover and cook 10 minutes. Season with salt & pepper. 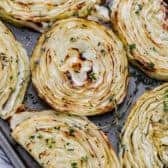 Roasted Cabbage Steaks are an utterly delicious way to give this green vegetable some star power at the dinner table. You will love the flavors that emerge from oven roasted cabbage. 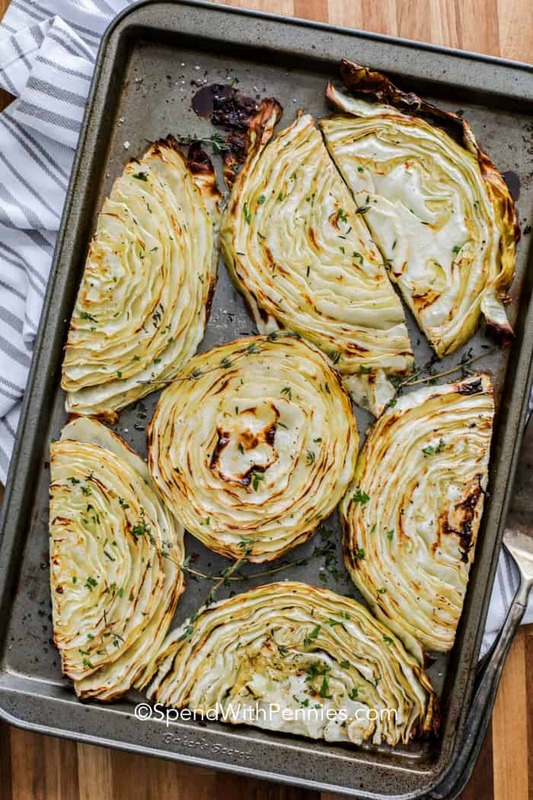 When sliced and baked, cabbage turns fork tender, with crispy caramelized edges that add sweetness and a satisfying full-bodied flavor and texture. 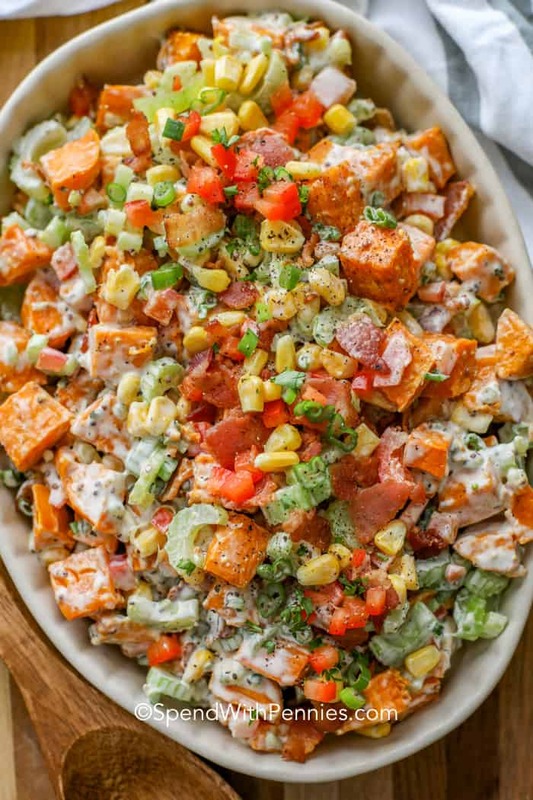 This easy side dish can be served with our favorite Meatloaf Recipe or alongside Oven Baked Chicken Breasts or a perfectly cooked pork tenderloin! Roasting vegetables at a high temperature allows them to caramelize creating layers of flavor. Cabbage is low carb and keto friendly making it the perfect side dish! In general, roasted cabbage is made with sliced heads of green cabbage. But roasted (or braised) red cabbage is delicious too! 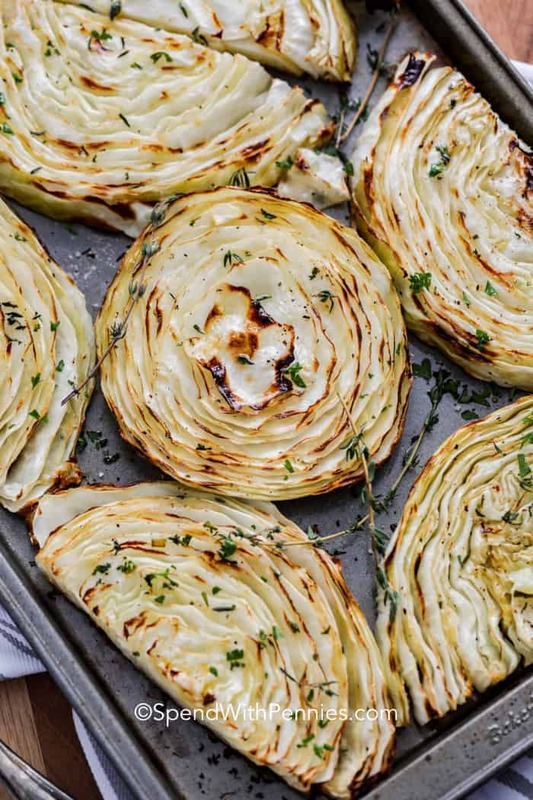 Cabbage is inexpensive, yet when you oven roast it, you can turn a humble veggie into something extraordinary. Slice a whole head of cabbage into ½ inch thick rounds. Brush each side with olive oil, and place on a foil-lined cookie sheet. Season with salt and pepper and roast. For some extra browning, you can pop then under the broiler for a couple minutes. 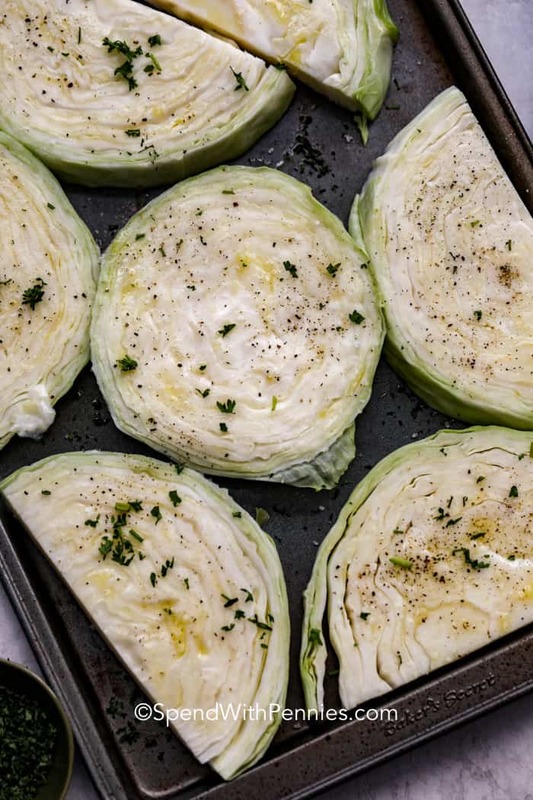 Just before serving, drizzle your roasted cabbage steaks with a little melted or browned butter. Baked cabbage steaks are the perfect savory side for corned beef, making for a pleasant deviation from boiled cabbage. They also go well with roast beef, roasted chicken, or any meaty, savory dish. As veggies go, roasted cabbage is such a hearty, substantial dish that you could even serve it on its own, as an appetizer or snack! Bread Crumbs: Buttery bread crumbs add a great texture crunch. Mix panko crumbs with melted butter in a skillet and lightly toast. Sprinkle over roasted cabbage slices. 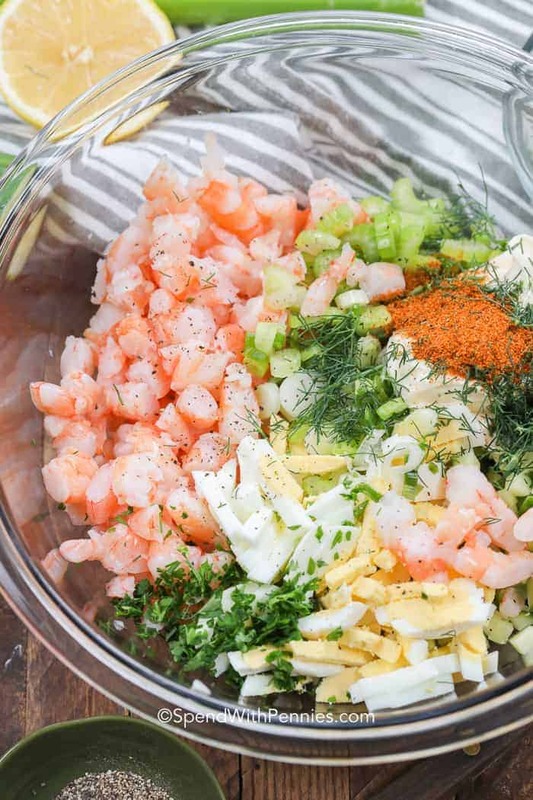 Herbs: Sprinkle with some fresh herbs, like parsley, dill, thyme or rosemary. Drizzle: Drizzle with a few drops of your favorite flavored balsamic vinegar glaze, freshly squeezed lemon, or melted garlic butter. Sweeten: Sprinkle some brown sugar over the top before popping roasted cabbage slices under the broiler for a minute, to bring out the sweetness even more. Roasted Green Beans – easy and delish! Roasted Tomatoes – Very quick (great with steaks). Roasted cabbage is an utterly delicious way to give this green vegetable some star power at the dinner table. Slice cabbage into 1/2″ thick rounds. 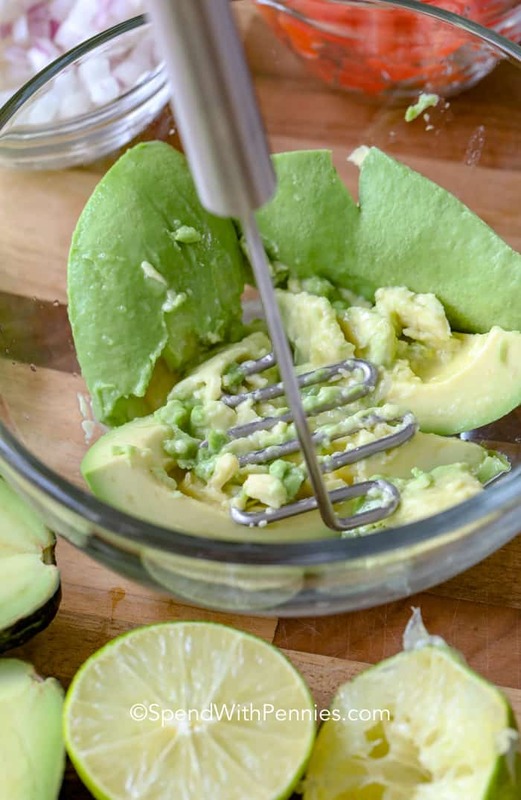 Brush each side with olive oil. Place on a baking sheet (cut rounds in half if needed). Roast 20-25 minutes. Flip and roast another 15-20 minutes or until cabbage is tender. Broil 1-2 minutes if desired. 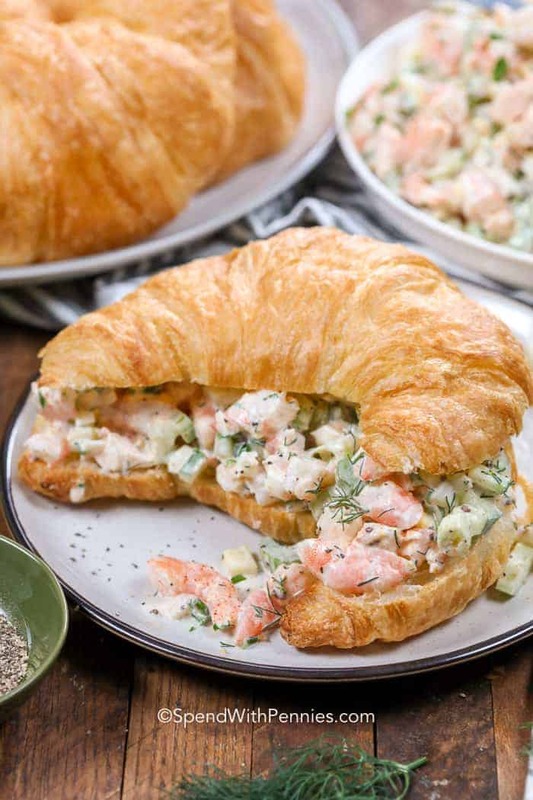 Drizzle with butter and serve.